Although Sherlock Holmes ranks as one of the most frequently adapted fictional characters of all time, the producers of BBC’s Emmy-nominated Sherlock have managed to make the detective seem as fresh as when his print adventures first began appearing in 1887. Just ahead of tonight's fourth season premiere, check out some facts about the Benedict Cumberbatch-starring production, an unlikely Watson, and why the original pilot episode never made it on the air. 1. A SHERLOCK LANDMARK HELPED MAKE THE SHOW HAPPEN. For years, writers Steven Moffat and Mark Gatiss took a train to and from Cardiff while working on Doctor Who, and discussed various projects they were interested in doing; one that kept coming up repeatedly was a modern-day adaptation of Sherlock Holmes. This reportedly went on for some time, with neither man making any particular effort to get it off the ground, until Moffat’s wife, Sue, decided to invite both men for lunch. Her selection: the Criterion, a watering hole and eatery in London’s Piccadilly Circus. It’s the same place where the fictional John Watson, Holmes’s best friend, first hears of the famed detective. The two got the hint and began working on the series. 2. THE ORIGINAL PILOT NEVER AIRED. When Moffat and Gatiss conceived of a modern-day take on Holmes for the BBC in 2008, the expectation was that their hour-long adaptation of Arthur Conan Doyle’s A Study in Scarlet would lead to a series. When they finished filming, however, those chances seemed slim: The pilot was more of a stodgy production than the cinematic, inventive style Gatiss and Moffat were hoping for. The BBC agreed to reshoot it with new director Paul McGuigan adding touches like having text messages appear onscreen. The less-polished prototype is available on the DVD release. 3. IT WAS INTENDED TO BE AN HOUR-LONG SERIES. 4. MATT SMITH AUDITIONED FOR WATSON. While Benedict Cumberbatch was the first and only choice for Holmes, Matt Smith was among a number of actors considered for his counterpart, John Watson.The role eventually went to Martin Freeman (The Office, Fargo) because Moffat believed his chemistry with Cumberbatch was the best. Smith wound up auditioning for Doctor Who just a week later, and became the Eleventh Doctor. 5. HARRISON FORD GEEKED OUT OVER IT. The quality of the series has not been lost on audiences, critics, or Harrison Ford: When the actor appeared on The Graham Norton Show alongside Cumberbatch in 2013, he told the actor the show was “amazing.” Ford’s wife, Calista Flockhart, told the Radio Times that she and Ford “can’t stop watching” the show. The family’s BBC gateway drug was apparently Agatha Christie's Poirot, a long-running adaptation of the author's elegant detective. 6. IT’S LED TO A RISE IN BOOK SALES. The estate of Arthur Conan Doyle must have been pleased to note that the 2010 debut of Sherlock on BBC One correlated with a sharp uptick in sales of the author’s printed works. According to Nielsen BookScan, which tracks media sales, copies of Doyle’s titles moved roughly 57,000 copies in 2009. The year after, it was 88,000—with sales the week after the show premiered doubling from the week prior. 7. FANS HAVE CHANGED HOW THE SHOW IS PRODUCED. When word gets out that Sherlock is filming exterior shots in Cardiff, fans gather using a Twitter hashtag (#Setlock) to watch—sometimes up to 300 at a time, all positioned behind barricades. Martin Freeman has described the experience as something “I don’t love,” since the crowd is effectively an uninvited audience. (They once broke into applause when he opened a bag of crisps.) Because of the distraction, Gatiss has noted that the show now arranges for fewer scenes set outside. “Large dialogue scenes outside are quite tough,” he said in 2014, adding that the actors had trouble concentrating. 8. PBS CUT A BIG CHUNK OUT OF EPISODES. If your only exposure to the second season of Sherlock was on PBS in America, you’ve missed nearly a half-hour of the show. In 2012, executive producer Sue Vertue told the Independent that eight minutes from each of the three episodes had been snipped in order to make room for sponsor spots in the United States. 9. THERE’S A MANGA ADAPTATION. An adaptation of an adaptation, in 2012 Japan's Young Ace magazine depicted the first episode of Sherlock in the country's distinctive sequential art style. U.S. publisher Titan Comics recently compiled the four issues into an English-language trade paperback edition after several unofficial fan translations demonstrated a considerable demand for the work to be reprinted. Titan also publishes books in which Holmes fights aliens and vampires. 10. YOU ARE UNLIKELY TO EVER SEE A CROSSOVER WITH DOCTOR WHO. Two of the BBC’s biggest successes are both filmed in Cardiff and both have the same showrunner; television crossovers have happened with less. Despite that, Steven Moffat—who oversees both shows—says the odds of the time-hopping Doctor crossing paths with Holmes are slim to none. In addition to the Sherlock cast being disinterested, Moffat told a Royal Television Society audience in 2014 the fact that Holmes has been presented as a fictional character in Doctor Who presents a difficult hurdle to overcome. “[The Doctor] has even dressed up as [Holmes],” the writer said. 11. 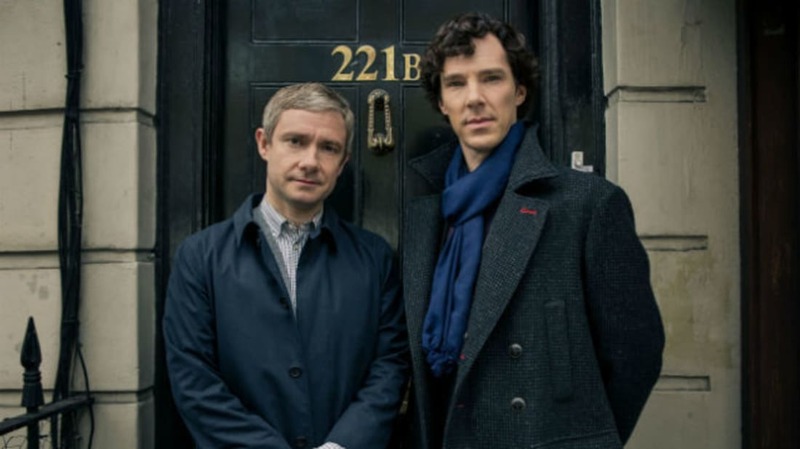 THERE MIGHT BE A SHERLOCK THEME PARK ATTRACTION COMING. Not many fictional detectives get their own theme park; Holmes might be a rare exception. The BBC is reportedly considering an amusement park based on their properties, including Sherlock and Doctor Who, for Kent, England, in 2020. The addition is expected to join a planned London Paramount Entertainment Resort that will also feature a water park. 12. THE SHOW MIGHT RUN FOREVER.